With over 950 fellows and 450+ organizations having participated in the program, the EDF Climate Corps alumni network is now over 1,700 strong. Are you an alumnus? We invite you to reconnect through the EDF Climate Corps network. 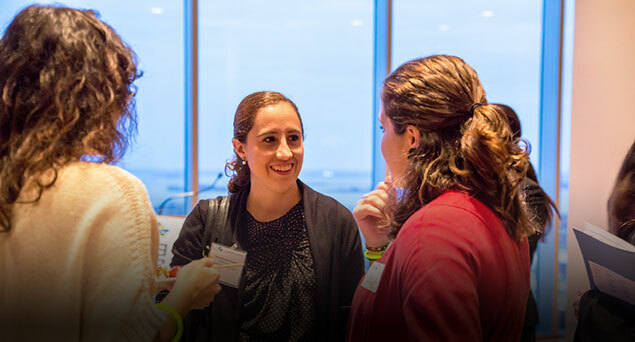 Join the EDF Climate Corps Connect platform and the EDF Climate Corps LinkedIn group and start networking with over 950 energy and sustainability professionals. Follow us on Twitter at @EDFbiz and join the conversation with #EDFCC. Each summer EDF presents the 3E Webinar Series: Energy Efficiency Expertise. This is a free webinar series featuring energy management education, inspiration and insight for our network of fellows, hosts, colleagues and friends. And, many of our webinars are hosted by our talented alumni! Join one live or watch a recording. EDF Climate Corps matches current fellows with alumni fellows each summer. If you are interested in being a mentor next summer, let us know. EDF Climate Corps Summit is EDF Climate Corps’ annual conference. Keep an eye out for details on the 9th annual EDF Climate Corps Summit in Fall 2018. Do you work at an organization that could use an EDF Climate Corps fellow next summer or do you know someone who could? Contact Yesh Pavlik Slenk to make a referral or start a conversation about how a fellow could help advance your energy management program. Check out the range of projects fellows can work on work on, each one custom-designed to meet your organization's unique energy needs. Is your company or organization hiring? Did you hear about a job opportunity that would be perfect for an EDF Climate Corps alum? Post it to the LinkedIn group, the Connect platform or reach out to us. Are you involved with your graduate university on-campus or as an alumnus? Spread the word about EDF Climate Corps and encourage current students to apply. Do you have a new job? Did you move or publish a paper? We want to know. Share your updates with us to be included in the alumni newsletter. Are you an alumni and not getting a monthly newsletter? Subscribe here! Do you have ideas for alumni activities? Do you want to plan a regional event? Reach out to Yesh Pavlik Slenk, EDF Climate Corps’ alumni network manager.